How many tabs are opened in your Internet browser right now? Well for me, it’s 17 in Firefox ver 21.0. I’m writing this post from one of those 17 tabs in Firefox – the only browser which is opened right now in my Windows 8 machine. So far so good, but I expect sudden crash of this awesome browser. Yes, confession that it is still awesome, and I love Firefox more than Google Chrome and Microsoft Internet Explorer. Part time mood changers are Opera, Maxthon and Safari browsers, each of which have their own flavor of surfing. Sadly, in this article I’m writing about why I’m quitting Firefox to be all time IE user, there is no alternative for me since I’m now a full time Windows 8 user with all my Workstations, and personal portable devices being Win 8 and Firefox not being in those favor at least for now. First, pro has nothing to do with expert user of Windows 8, but I believe so after using Windows 8 for more than 17 months by now. The story of saying bye bye to Firefox, and adhering with IE 10 the other way confession. So, what’s wrong with Mozilla Firefox? 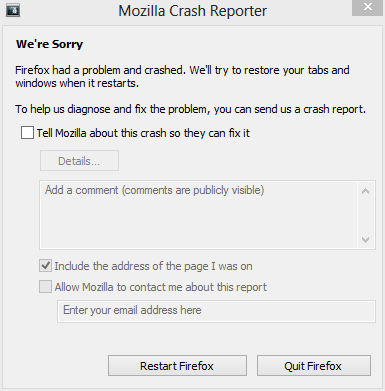 Well, Firefox has given me nothing more than worried early morning moods, it is the only thing that I use most so does crash all the times. I am was addictive to Firefox because of its awesome features of sync and possibilities of several hundred add-ons to make life easier. Earlier it was a sad news from Mozilla that they are no more developing 64-bit version of Firefox, however, later they changed their mind and announced to continue (?). The main concern for me with Firefox are stability because of add-ons issues and responsiveness to the touch input devices – in both of these cases Firefox performance has been disheartening, let’s explore the dark side of Firefox. Many years ago, I was concerned about the power hungry nature of Google Chrome, that was when Chrome was in hype but later for many obvious reasons I left being sole Chrome user (read the story here: Google Chrome is a no Exception to errors and CPU hungry.) Sadly, the trend of consuming more and more power by the Firefox browser is being one of the worried things in here. Just two tabs of a Firefox, as illustrated in the screenshot, is consuming about 614 MB of the memory (out of 8GB) and 6.8% of the CPU power (while the overall CPU used is merely 9%) – one tab playing a YouTube video and the other Facebook home page. Can we conclude that YouTube is power hungry or is making Firefox do so (Read below for related video playing add-on issue in Firefox) or is Firefox just okay enough for two tabs. An optimal number of tabs that should be left open in Firefox is 9 (AFAIR) must mean the power holding capacity of Firefox. Another issue in here is, Firefox 32 or 64-bit version? Wish the performance was better despite 32 vs 64 editions – but what use is not-having 64-bit Firefox when your entire world is already 64-bit? Download, install, sync and customize. Wait, right there is customize which deploy several add-ons to make your customized browsing experience. However, it is add-ons that are making Firefox’s performance to question – that’s what I have been trying to point out here. Add-ons and Plugins for Firefox’s necessary Evil – you need them but they give your torture when you use them at the level they don’t want to be (used.) 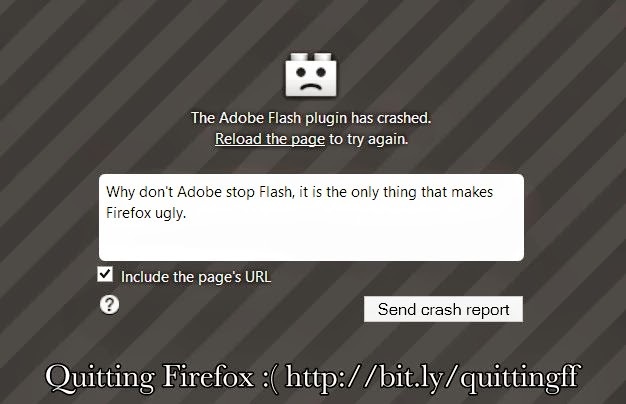 I believe Adobe’s Flash is the worst add-on or plugin ever invented and compatible for Firefox. While things are pretty well with HTML5 in YouTube videos, most of the internet is still with Flash including BBC & CNN’s news videos. As a personal experience I have completely disabled Adobe’s Flash player, PDF viewing software application, Google Update, & VLC Web Plugin in Firefox – they can always be enabled when required. Luckily, Firefox has native support for pdf file browsing and media browsing can be experience without heavy plugins. Disabling plugins / addons and enabling them only when required will surely charm and performance in your browsing experience as per my understanding. Mozilla security blog advises a blocklist style called click-to-play plugin but we haven’t found that being implemented widely. Touch Input & Default Zoom in Firefox, nahh! My two ONLY reasons to quitting Firefox to IE. Wish Firefox could itself zoom to fit the entire screen of your computer like IE does in Windows 8 mode. The surfable (!) portion of the website (when they are center aligned & boxed mode) looks very small when you have a high resolution screen, this brings in a worst browsing experience. The resolution of 1600 x 900 in IdeaPad Yoga 13 makes Firefox just too small to surf. Why Firefox is damn irresponsive to touch input? The same applies to Google Chrome as well. The Internet Explorer (IE 10) in Windows 8 is so touch friendly and at the same time Firefox is just too bad – I can’t zoom in, pinch or point to type, 10-fingers capability of my Yoga 13 is just no use for Firefox. Being a full time surfer and Firefox just not loving touch input, my saddest decision is to switch back to IE 10 – both desktop & Windows 8 mode. 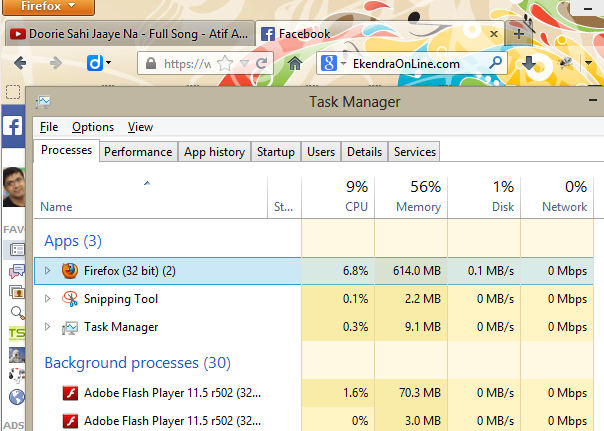 Wish Mozilla could bring in Windows 8 mode or app for Firefox soon, or atleast a better touch support. To conclude, when Mozilla will bring the touch-first concept in Firefox I’ll definitely come back to Firefox. Maybe Mozilla can deploy the touch experience from the Firefox’s Android version to Windows 8 app or desktop app but with superb touch support – the world now is tapping screen rather than clicking. Firefox should care more. Whatever the future holds, for now I’m just quitting Firefox to Internet Explorer (IE) for those obvious reasons.